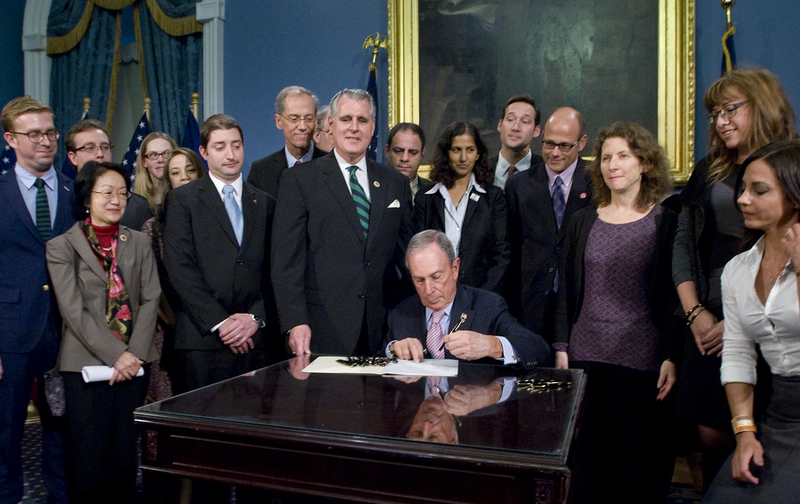 On Tuesday, November 19, 2013, Mayor Bloomberg signed landmark legislation making New York City the first major city in the country to raise to 21 the minimum sale age for cigarettes, cigars, and electronic cigarettes. The Mayor also signed a law that will stop tobacco industry discounting schemes, set a $10.50 price floor for a pack of cigarettes or little cigars, and crack down on cigarette tax evasion. While the smoking rate in NYC is lower for youth and adults than the national rates, the recently released Mayor’s Management Report shows that the adult smoking rate, currently at 15.5%, has remained essentially unchanged since 2010. Ten years ago today, New York State passed the expanded Clean Indoor Air Act making all bars, restaurants and bowling alleys smoke-free. Thanks to this groundbreaking legislation, New Yorkers all across our State could enjoy a smoke-free night out with family or friends. Also, hospitality workers who had been forced to breathe in secondhand smoke during each shift could now go to work without endangering their health.